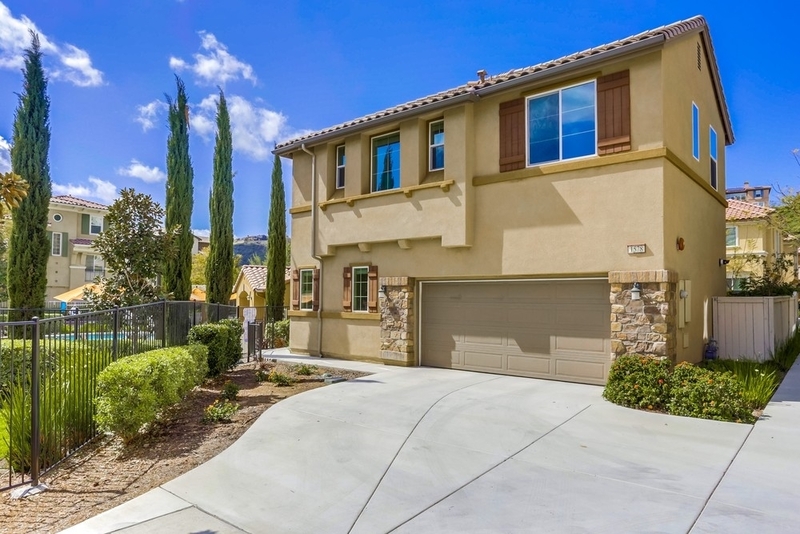 Beautiful 4-bedroom, 3 bath San Elijo Hills home! Nestled in the highly sought after gated community of Belmont, this home is move in ready! Step inside the welcoming and airy open floor plan featuring gorgeous porcelain tiles and a spacious Great Room! A first-floor bedroom with bath makes a perfect room for guests or visiting relatives. Plenty of windows provide natural light. The lovely, low-maintenance backyard with travertine pavers, features a spacious patio with ledgestone sitting wall., The built in 10' umbrella provides plenty of shade on sunny days or retracts to allow you to enjoy the stars. Upstairs loft and 3 bedrooms upgraded with hardwood floors! The private and spacious Master Bedroom has an amazing master bath with huge walk-in closet. Tankless water heater is an added bonus. Attached 2 car garage with a long driveway for additional parking is a unique feature. Belmont community offers a gated pool, spa and BBQ area. Enjoy high-ranking schools, ballparks, soccer fields, playgrounds, dog park, and community center all within walking distance! Plenty of shops and eateries along with 18 miles of trails, 19-acre park, and acres of open space to explore! This is a tranquil, small town while being minutes away from everything you could ever need including shopping, restaurants freeways and beaches!